BRIGHSTONE & SHORWELL BROWNIES JUMBLE SALE. 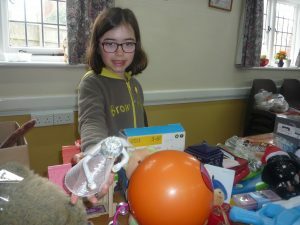 At the recent Jumble Sale organised by 1st Brighstone and Shorwell Brownies and held at the Wilberforce Hall, Brighstone a sum of £222.50 was raised. Brownie leader Anne Watson thanks all those who donated goods or attended the jumble sale. One Brownie Esme Gosden (10) organised the toys and games stall. For several years, the Brownies have sponsored a child in Zimbabwe and the monies raised will help the sponsorship to continue. At present the Island girls are supporting Siliana Hungwe and her family in the Chiredzi area of Zimbabwe. In a recent up-date on Siliana from the charity ‘Plan International Zimbabwe’ the Brownies were informed that Siliana likes Maths at school and is keeping well. In her area there are various projects to help the community including provision of seeds and agricultural training for farmers and training for children on health issues.